Oblique aerial view of Caisteal Dubh, taken from the SW.
Oblique aerial view of Caisteal Dubh, taken from the SSW. 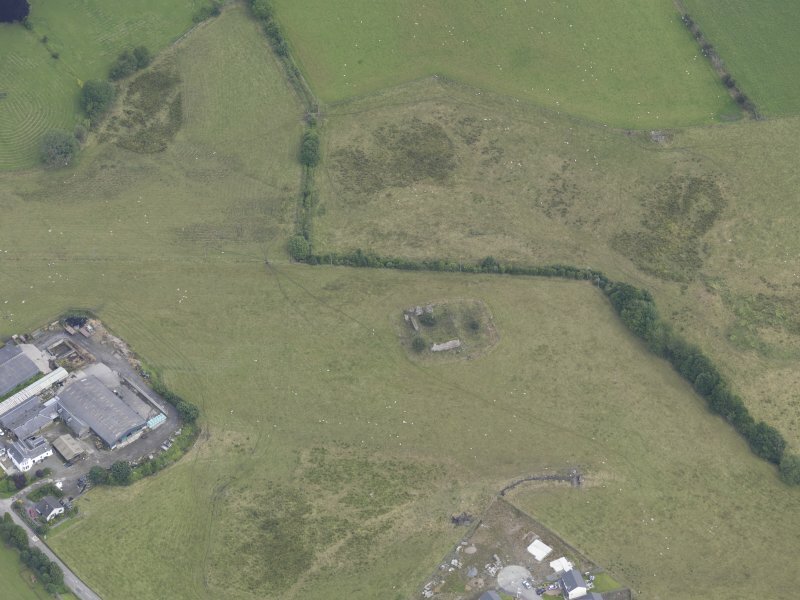 Oblique aerial view of Caisteal Dubh, taken from the S.
Oblique aerial view of Caistal Dubh, taken from the WNW. 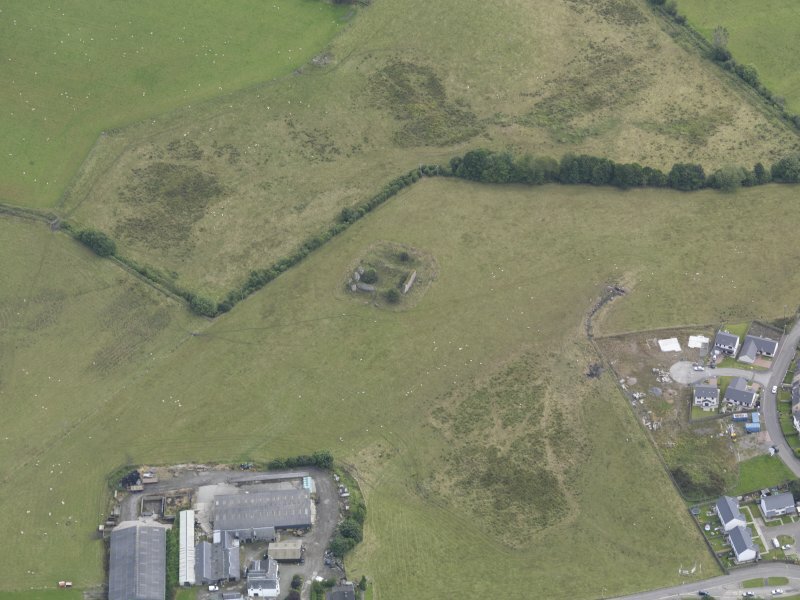 Oblique aerial view of Caistal Dubh, taken from the NW. 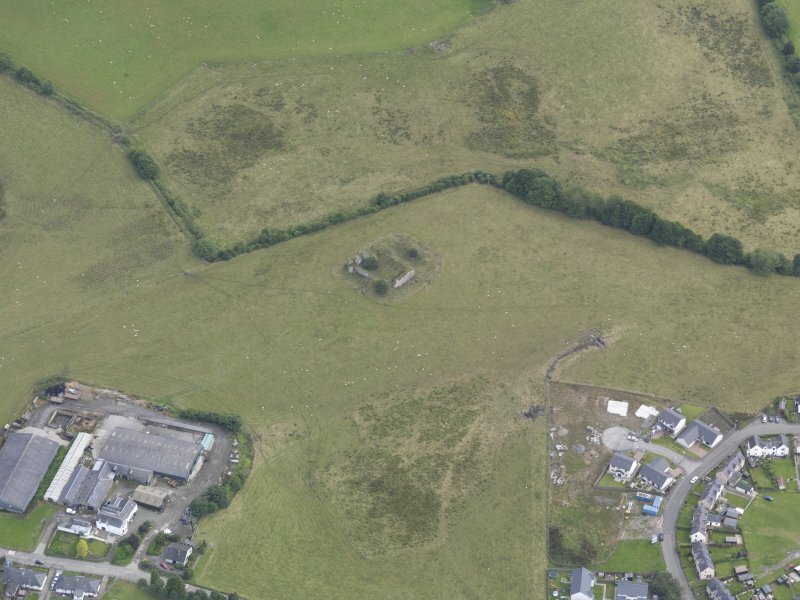 Oblique aerial view of Caisteal Dubh, taken from the W.
Known as 'An Sean Chaisteal' and 'Caisteal Dubh Mhaothlinne'. This 13th century castle has been about 110' N-S by 85' E-W. The walls of the quadrangle are 6' thick and have probably been nearly 30' high. The only round tower remaining is at the NW angle and the walls are fragmentary (MacGibbon and Ross 1887-92). 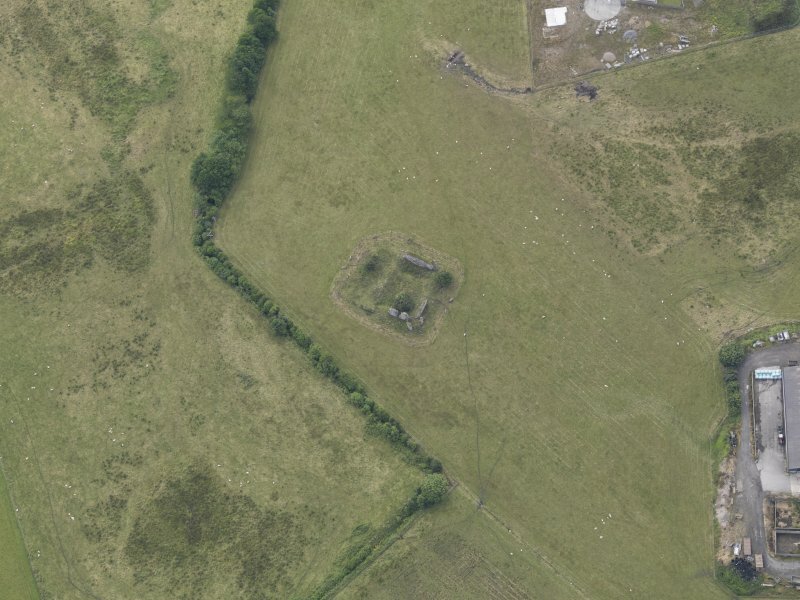 The castle is supposed to have stood on an enlarged crannog in the centre of a lake but was probably merely moated. The remains of a stone path lead from Balnadrum farm towards the castle (Dixon 1925). D MacGibbon and T Ross 1887-92; J M Dixon 1925. Caisteal Dubh was built about 1326 on an island, or crannog, in a lake, and a landing place for boats, a causeway, was uncovered at Balnadrum some years ago. It was inhabited until 1500, when traditionally it was fired because of fear of plague. The lake was drained about 1720, but remained a marsh for 100 years. Still known as Caisteal Dubh, this early castle survives in a poor and ruinous condition in a cultivated field, and is generally as planned by MacGibbon and Ross (1887-92). The foundation of the SW tower is now visible, and another internal wall. There is no trace of a moat, nor of a crannog. There is little doubt, however, that the area was once a loch, and the castle stands on a slight rise, which would have been either the end of a low peninsula, or a very shallow point in the water. There is no knowledge now of the alleged causeway. Visited by OS (A A) 11 April 1975. NN 9465 5875 An evaluation was undertaken in July 2005 prior to the construction of housing. The site was located on a rise 200m to the SW of Caisteal Dubh (NN95NW 1), a 13th-century castle in the vicinity of a possible souterrain (NN95NW 3), and on the edge of a small loch drained in the early 18th century. Eight trenches were machine-excavated across the site, equating to 290m of linear trenching. Only one feature of archaeological significance was discovered; a possible 18th-century rubble field drain that may relate to the draining of the loch, following the lowest contour of the rise. Report to be lodged with Perth and Kinross SMR and NMRS. Sponsor: Classic Experiences Pitlochry Ltd. 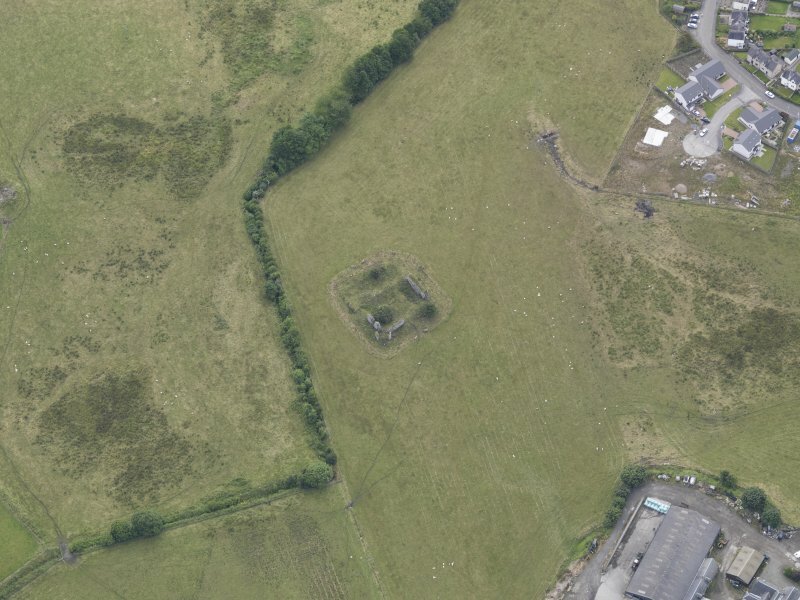 This site was included within the RCAHMS Emergency Survey (1942-3), an unpublished rescue project. 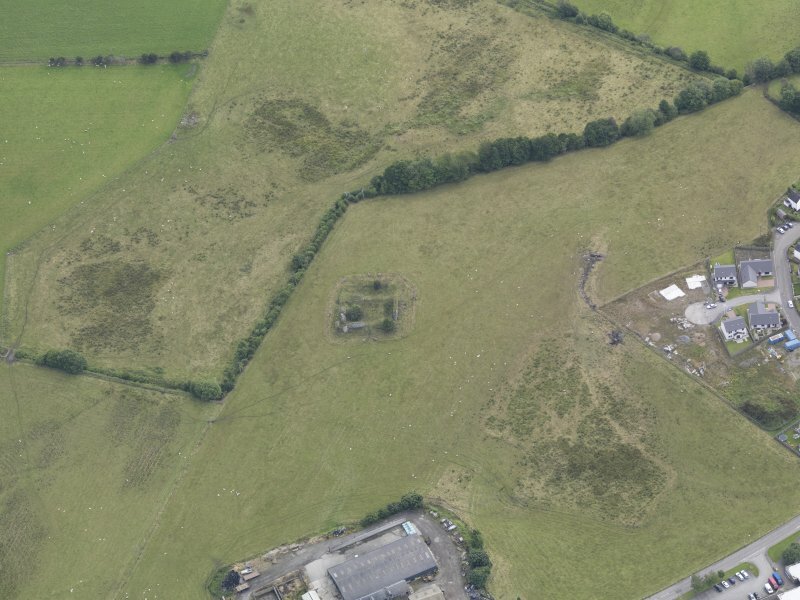 Site descriptions, organised by county, vary from short notes to lengthy and full descriptions and are available to view online with contemporary sketches and photographs. The original typescripts, manuscripts, notebooks and photographs can also be consulted in the RCAHMS Search Room. Information from RCAHMS (GFG) 10 December 2014.